* Trayee kicks off with a spicy and sweet punch, blending black currant jam with clove/cardamom. * Part of a trio of fragrances celebrating the history and traditions of India by Neela Vermeire and perfumer Bertrand Duchaufor, Trayee draws inspirations from religious rituals and traditional Indian medicine. * If you can imagine smoky florals, that is what comes next. Like a hazy veil, jasmine and yiang yiang float in over the blackcurrant and make a brief appearance. * The Vedic period is the inspiration of Trayee, beliefs that became the basis of modern Hinduism. * The smoke turns into incense which blends the blackcurrant of the top notes with the woods, balsams, amber, and patchouli in the base notes. Summary: Trayee is a journey from sensual to spiritual- as if you are going from a Bollywood-themed festival to a celebratory religious service. Projection is moderate, so you could wear this to work in the morning and it will last into the evening, making a perfect base for something to be added to. If you really love the top notes, spray it on your shirt rather than your skin and it will surround you in a halo of scent. 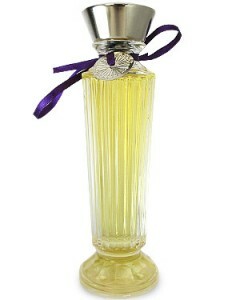 Trayee is available at Lucky Scent and the Neela Vermiere website. Trayee is my second favorite out of the three. And now I’m curious to try spraying it on my clothes, thank you for the idea. Don’t thank me.. thank Neela. She sprayed it on a glorious orange silk piece of fabric for me when I met her. When I sniff the fabric, I can still smell it.. three weeks later. Meeting her was quite wonderful, she has such an amazing spirit and heart. This is what I’m wearing today! I love it. It is so delicious but not edible. This is my favorite of the line. But I won’t say more as I’m working on a post at the moment. I like and plan to review all three, but want to space them out. Make sure you put a link here when you have your review posted.. I can’t wait to see what you have to say.